It’s going to be a few weeks before my alter ego has to get to work on JERICHO revisions, but I went ahead and made a batch of revision cookies anyway. I like to have food squirreled away in preparation for the long march to –30–: soups, burgers of various types, maybe a meatloaf. Chicken breasts and portions of fish. And home-baked cookies. I’ve tried making do with packaged cookies, and they’re not the same–I don’t feel like I’m having an end-of-the-day treat when I have one of those. There are some bakery cookies that I love, especially the whole grain-dried cranberry and cowboy cookies from Whole Paycheck. But in that case, I need to make a choice between a month’s supply of cookies and paying the mortgage, and if I don’t keep up with the mortgage, I won’t have a place to write. So, I bake my own cookies. Ina Garten has a couple of cookie recipes that have become standbys, namely her Oatmeal Raisin Pecan and her Ultimate Ginger. I had a boatload of old-fashioned oats, and I love oatmeal cookies, so I opted for the Oatmeal Raisin Pecan…with a few changes. I substituted dried Door County cherries for raisins. I love raisins, but I wanted to try something a little different. Instead of all-purpose flour, I used 1 cup Bob’s Red Mill Whole Wheat Pastry Flour and 1/2 cup wheat germ. The w/w pastry flour worked well when I made a loaf of post-first draft banana bread a couple of weeks ago–apparently it’s made from the soft wheat berry, so it’s higher in carbs, with less gluten and protein. Because of those characteristics, I have found I am able to use it as a replacement for all-purpose, at least so far. I am guessing that if I tried to make pie crust or some types of bread, the story would be different. But I’ve found the cookie and banana bread recipes to be pretty forgiving, so I will stick with whole wheat flours when I make them. I added about a cup of unsweetened coconut to the pecans and toasted the whole mess together. Spices. In addition to the cinnamon, I added 2 tablespoons Spice House chai spice. It sounds like a lot. But the directions state to use 1 tablespoon in a 6 oz cup of tea, so I figured that 2 tablespoons wouldn’t overwhelm a recipe that can yield 3 dozen cookies. Verdict? 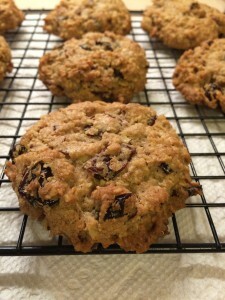 The flour and wheat germ worked great–the cookies are moist and have a little chew, which is how I like them. I don’t like really chewy, soft cookies. The cherries are good, but a little on the sweet side. Next time I will use raisins or good dried cranberries. As for the chai spice, it added nice depth. I might back off to a tablespoon or a tablespoon and a half next time, though, because it is strong. I will see if the flavor mellows over the next few days.